Police investigating the murders of a mother and her daughter in Merseyside urgently want to trace one of their relatives. The body of Bernadette Fox, 57, of Brookhill Road, Bootle, was found on Friday while her daughter Sarah Fox, 27, was found on Thursday. 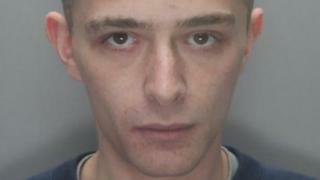 Police want to trace Bernadette's son, Peter Fox, and have advised members of the public not to approach him. The family of the women said they were "absolutely devastated" by the deaths. Det Ch Insp Dave Rooney said the motive for the killings was "unclear at this time". "We are currently trying to trace Peter Fox, the son of Bernadette, as he could have information which could assist with our investigation," he said. "I would stress to the public that if they do see Peter Fox, they should not approach him." The body of Sarah Fox was discovered with several injuries at a property in Worcester Road at about 21:15 BST on Thursday. The body of her mother was found at 04:00 on Friday. The roads where the bodies were found are within 200m of each other. A spokesperson for the family said: "We are absolutely devastated following the loss of Bernadette and Sarah and are still trying to come to terms with what has happened to them both." Bernadette, who was a mother of three and grandmother of three, was described as "a very outgoing and lovely person who wouldn't harm anyone". The spokesperson said Sarah was "well-liked" and a "fantastic auntie", as well as being a "cheeky, bubbly and outgoing person who loved her dog". Post-mortem investigations found Bernadette died as a result of asphyxiation and Sarah died as a result of multiple stab wounds.